The executive producer of Top Gear has launched an attack on publisher HarperCollins over a book that reveals the true identity of The Stig. Andy Wilman wrote on the show's website the BBC had a right to protect Stig's anonymity "from a bunch of chancers" who were "hoping to cash in on it". Both sides appeared at the High Court earlier this week as the corporation tried to halt publication of the book. The BBC said the planned book would breach confidentiality obligations. However, HarperCollins said it would "vigorously defend" its right to publish the book, adding it was "disappointed that the BBC has chosen to spend licence fee payers' money to suppress this book". 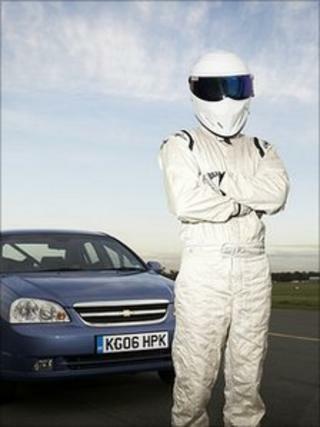 In a blog post entitled "The Stig. He's ours", Mr Wilman wrote: "I feel the urge to add my ten penn'orth about how we see things down at the Top Gear office." Responding to HarperCollins' comments, he said: "The BBC has the right to spend money on protecting the intellectual property it created. "The truth is that all that stuff - the Stig, the Tardis, the Blue Peter dog - does belong to the licence payer, and not to some opportunists who think they can come along and take a slice when they feel like it." HarperCollins declined to comment on Mr Wilman's blog post. Mr Wilman argued that the reason why The Stig, who test drives the cars featured on the show, never removed his helmet was to protect the character's mystique, which the audience finds entertaining. "HarperCollins have decided none of that is as important as their profits," he wrote. "So if you get your Christmas ruined by one of the best and most harmless TV secrets being outed, you can rest easy in the knowledge that by contrast, HarperCollins' executives will be enjoying a fantastic Christmas." He also made an apparent dig at the driver who wears Stig's helmet, saying: "It's an issue of trust. Everyone who's ever worked on Top Gear has kept the Stig thing a secret, and the person who wears the suit has signed confidentiality agreements to do the same. "So talk about what you like in your own life, but not the bit you agreed not to. Your word is supposed to mean something." He concluded by saying he would continue to fight the case because the Top Gear team had "worked bloody hard for many years to make the Stig something worth caring about, and that includes protecting it from a bunch of chancers".